Word of mouth marketing has always been a cornerstone of a business’s marketing plan. When a person is looking for a new service provider, they often consult their friends and neighbors, or they search for reviews on the internet. Nothing sells a business better than a recommendation from a real human being. According to Forbes Magazine, recommendations are the number one driver of consumer purchases. No matter what stage of the purchase decision-making process a person is in, the suggestions of family and friends will often trump even advice from experts. How can you use this information to help your local business? 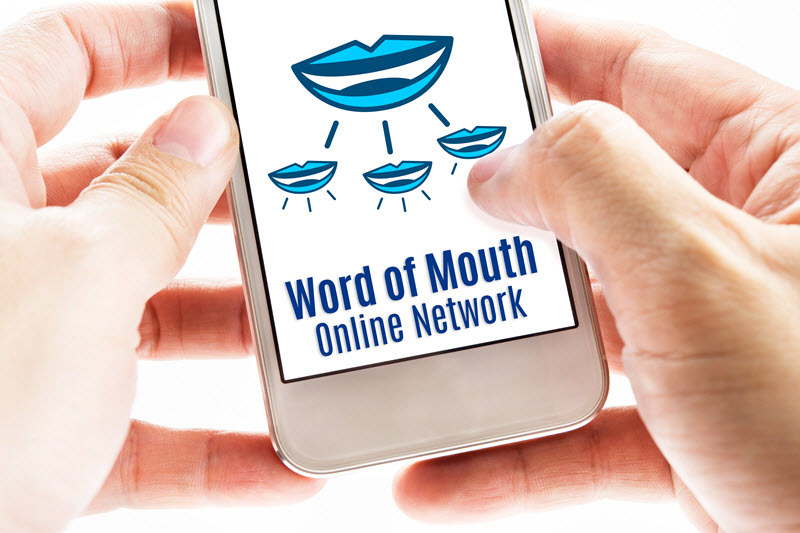 We’ve got some tips that can help you harness the power of word of mouth marketing to work in your favor. If you’re eager to get positive word of mouth recommendations from your customers, the best way to do that is to treat them better than the other businesses in your industry. Attention to detail and excellent service should be standard, but people often remember seemingly insignificant details that turn good service into stellar service. These details can make the difference between simply providing a service and creating a genuine relationship and a memorable emotional response. Here is a good example of paying attention to the details. I know several home cleaning services that provide a small service that is not on the specifications list and takes less than 5 minutes to do. For example, one week they might clean out the dog’s water dish and refill with fresh water. On their next visit they might clean the kitchen trash can inside and out. 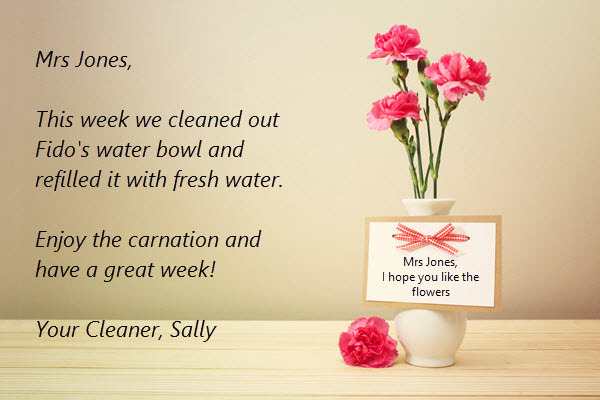 The cleaners leave a hand-written note about the extra service they did along with a sweet treat for the client or their children. One service even leaves a bud vase with a fresh carnation flower and changes it out for a new flower every visit! Pay attention to the details and watch your word of mouth marketing soar! A personal connection with current customers is an excellent way to gain future customers. This feeling of connection will lead your customers to share their positive experience with their friends and family, which will lead to even more good word of mouth marketing. Often, complaints strike fear in the hearts of business owners. We work so hard to create a great experience for our customers, it’s hard to accept that we didn’t succeed. When a customer has a question or complaint, you might feel defensive. Take a deep breath, count to three, and listen. Listen to your customer’s issue, accept their point of view, and work with them to resolve it. A willingness to listen and to respond to criticism can turn a negative experience into a positive one. Additionally, the more you listen to your client, the more willing they’ll be to listen to you when it’s your turn to speak. Most importantly, complaints can help you correct any deficiencies that might be visible to your customers but imperceptible to you. Your ability to embrace constructive criticism and implement change based on it will leave your customers with a positive impression, ensuring their good recommendation down the road. If you’re adhering to the advice we’ve given above, there’s plenty of room for you to ask for online and offline reviews. Social media mentions, local reviews, and personal recommendation increases your exposure in the marketplace. Additionally, if you use a service such as MoreReviewsNow.com, you can even automate the process of asking for feedback and online reviews. This makes very simple for your customers to share their opinion with others. The easier you make it for them, the more likely they will take the time to share their opinion. Interpersonal relationships feed word of mouth marketing, so the more relationships you build, the more word of mouth marketing possibilities you will attract. As a local business, you’re connected to other business niches within your community, so make it mutually beneficial to you both. For instance, local wedding planners are connected to hairstylists, caterers, religious groups, musicians, wedding fashion services—the list is endless. Mutually promoting related providers can give you all a leg up within your community, which is a win-win for all. Visibility is vital to your marketing plan. Get your business name and phone number as visible as possible; on vehicles, business cards, and even clothing. Familiarity is comforting to customers—if they recognize your name, you’ve got an in. Networking groups, meet-ups and social events are another way to get your name out into the community. It’s a good opportunity to connect with non-competing businesses for mutual promotion. Also, when you DO get good publicity, whether it’s in a newspaper article or a television story about your good deeds, be sure to publicize the publicity! It can establish you as the leading authority within your niche. Who doesn’t want to work with the industry’s leading authority? The word of mouth possibilities are endless. Looking for an automated way to get testimonials and online reviews? Check out our service, More Reviews Now! Click on the button to learn more.